We have some new aircraft available for assignment in the CAF. If you or your Unit have any interest in seeking assignment of an aircraft please contact David Oliver at doliver@cafhq.org within the next 30 days. Please note that new CAF Units and CAF Units without an assigned aircraft generally have preference. #1. Contact David Oliver to give your expression of interest and discuss your Unit situation. #2. Unit Officer vote at the squadron level to seek assignment. #4. Your submission will be reviewed by the American AirPower Heritage Flying Museum Board for Unit selection and approval. With 2 weeks to go we need more registrations to ensure a successful clinic. In order for the even to break even we need 10 paid registrations and right now we have 5 airplanes and 7 participants. Registration covers the costs of pilot snacks, lunches, the welcome BBQ, and one hotel room for volunteer ground personnel support. So, register now by clicking on this REGISTER link and sending a quick email, that would be most helpful for our planning purposes. I’m currently working with Clover Control to get some Restricted Airspace carved out for our Formation Operating Areas, and discreet frequencies. We will also have the Aerobatic Practice Area Waiver over the airport. This is great airspace and a great time of year to get the rust knocked off before the summer flying season or begin the journey towards a FAST card. We are grateful for the members of the Utah Wing of the CAF, CAF HQ in Dallas, TRARON, the RPA, and NATA for all stepping up and pledging their support. There is every reason for us to be sharing resources and making good on the pledge that “FAST is FAST” by training to a common standard, understanding operational differences, and supporting our precious privilege to operate these great airplanes. WHAT: FAST Formation Clinic. Brand new formation pilots, those interested in being a brand new formation pilot, and seasoned veterans alike are all welcome. WHEN: Thursday June 1 thru Sunday June 4. 90 Minute Ground School will be Thursday at 1800 followed by a BBQ on the ramp amidst historical WWII hangars. WHERE: KENV, Wendover, Utah (on the Nevada/Utah border) home of much WWII history and adjacent to the Bonneville Salt Flats. Located approx. 90nm due west of Salt Lake City. WHY: Why not?! Camaraderie, high quality training, and fun. Cost of the clinic will be $95 and includes a welcome BBQ on Thursday evening, lunch each day, pilot drinks and snacks, and whatever pilot schwag we can come up with. This is a great opportunity to visit and fly at a truly historic airfield - selected by Paul Tibbets to train the B-29 crews that ended WWII in the Pacific. Tons of ramp space, great facilities including a B-29 hangar we can use if we get bad weather, and open airspace. Please REGISTER HERE so we can get a headcount. Registration fees will be collected on site. IMPORTANT - Below are the following hotels for which we have negotiated group rates. Please use the group code FORMATION CLINIC to get the discounted rate. Wendover is a border gambling town so they tend to sell out on the weekends. Please make your reservations ASAP to ensure you get a room. Please contact me directly if you have any questions, and please spread the word! Volunteers Needed for C-47 "Thats All Brother"
"Thats All Brother" is undergoing a major restoration and you are invited to participate. We need volunteers who are willing to travel to Oshkosh Wisconsin and help clean and prep the inside of the fuselage for paint. The job is ready now for anyone who is willing. If you have some basic mechanical or cleaning skills and can take care of your own travel we would love to have you help! Please contact David Oliver at (doliver@cafhq.org) to find out more information. On May 18th through the 21st the AirPower History Tour and TRARON have combined to host an event at Dallas Executive Airport (KRBD). What better way to share the joy of aviation and formation flying than to give the general public the opportunity to watch. The event promises to have lots of flying, education activities, and cockpit tours. We also need more Formation Instructors as well as anyone intersted in attending their first clinic. If you have a C-45 or a T-6 and are interested in attending please register or contact me (doliver@cafhq.org) for more information. This year we are also working to develop a large aircraft formation training syllabus. To register click on the button below. (Pre-requisite experience may be required for large aircraft). If your interested in just attending the AirPower History Tour with a static or ride aircraft please RSVP to Brad Pilgrim (bpilgrim@cafhq.org). Hope to see you there. Click below to register for the Formation Clinic. 2016 had more incidents and accidents in the CAF than any other year previous. Fortunately not a single person was harmed. But what happened in 2016 that led to so much bent metal? Jim Lasche our CAF Director of Operations & Maintenance presents the facts at Wing Staff Conference as safety was the major topic. We video taped the session and have made it available online as a training course. This is perhaps one of the most important video's to watch. Click below to see what happened and why. Video not displaying? Click HERE to watch it at our new CAF Operations Website. Up for assignment in the CAF is a recently donated exhibit trailer. This trailer has been donated to the CAF and is available to a Unit. Although the trailer has been previously used by another exhibit, the trailer is in good condition. The previous exhibit that you see in the picture has been removed and the trailer is essentially an empty shell. Its a build to suit structure that is available for your Unit. The estimated cost to upgrade and outfit the trailer similar to the Redtail Exhibit would be $150,00 to $200,000. Click to see more photos and information. Thats All Brother Needs Your Help! While it might not seem so from the picture, That’s All Brother, the C-47 that led the airborne invasion and dropped the first paratroopers into Normandy, is well on its way to flying before the end of this year. The next phase is returning the aircraft to it’s original D Day configuration. That’s All Brother has been completely disassembled, inspected, and all unairwothy parts replaced. As you read this, our partners at Basler Turbo Conversions are well on the way to reassembling the airplane for a summer delivery. While the Central Texas Wing will be managing this uniquely historic aircraft, it belongs to all of us in the CAF and we’ll be looking for members from all over the country to help us meet its flight operations and appearance schedules. We’ll need help with every aspect of the operation from maintaining and flying this historic aircraft to writing press releases, and giving tours. The first step, for those of you who are interested, is to go to the website, centraltexaswing.org, and become a member of the wing. Be sure to note your interest in supporting TAB and specify how you would like to participate. Who ever knew that Football in Texas was important? Well we do and we want to be sure that Wings Over Dallas 2017 has the perfect fall date. Please mark your calendars now, our official Wings Over Dallas Dates are October 6-8, 2017. 2017 promises to be a great year and Wings Over Dallas has already chosen a “Heavy Bombers Theme” for 2017. All CAF aircraft are invited and welcome to attend. Whether your unit desires to sell rides or just coming for the fun, you and your CAF unit and aircraft should plan on attending. With the 75th anniversary of the Doolittle Raiders and the hope to get all of the CAF B-25’s to attend, we are most certain to have an all star line up of bombers, transports, liason, and fighters. We are even planning a Formation Clinic for the days prior leading up to the Airshow. We are excited to roll out the new web site for the formation training arm of the CAF. www.cafformation.org is the new online home for TRARON, the FAST signatory for the CAF charged with overseeing formation training to FAA acknowledged standards. Communication is a key element to our success and we hope that you will find the new web site informative, easy to navigate, convenient, and reliable. We will be improving the site as time goes on, with our goal to make it a one stop shop for all things formation. Right now you can find information on upcoming clinics, download membership forms, learn more about your leadership team, and review recent articles on formation flying in the CAF. We will shortly add features to include being able to pay your membership dues online, an online directory, information on how to host a clinic, and much, much more. We are very excited for the renewed enthusiasm for formation flying in the organization. We are working diligently behind the scenes to take TRARON to new heights and encourage everyone to get involved. If you have any questions or would like to help in any way, please contact me directly at pilotmaker@icloud.com. The Restoration Grant Fund is a very important way of promoting and encouraging restoration projects in the CAF fleet. Many aircraft have been returned to flying status with the help of the fund. The 12 Planes of Christmas campaign has been very successful in helping to rebulid the Restoration Grant Fund for 2017 and we are asking for all Units who have restoration projects to apply. 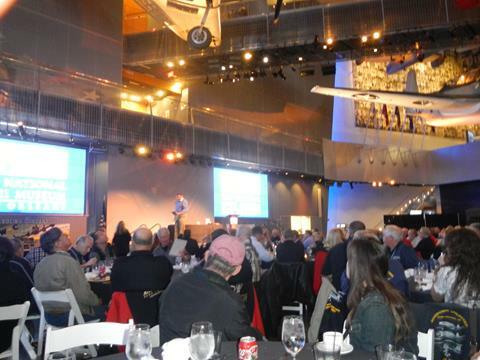 The American AirPower Heritage Flying Museum Board will have responsibility to appropriate the funds. The board is intending to meet in March during the CAF Wing Staff Conference. The final results should be available soon after. Please click on the button below to submit your application online. I want to take a moment and introduce you all to the new CAF Operations Website. www.CAFoperations.org is now up and running. The website is designed for anyone who operates CAF aircraft. Whether your logging into Fortress or completing flight forms on your smart phone, the CAF Operations Website is designed entirely as a resource for the member. We are working to add new things daily and have lots of ideas for the future. Perhaps the biggest news is the required Online Training for pilots and mechanics each year. Hopefully you all find the training programs to be informative and easy to watch. Just click on ‘Training’ and you can see the video courses that are offered. Here are some of the courses available so far. - - Online CAFR 66-1 training required for all Maintainers. In addition to these online video courses the website also offers an online CAF Operations Forum. The forum will have tips, tricks, and updates as well as allowing you all to post comments, questions, and discussions. The online forum is open to all CAF Colonels and is a great way to collaborate with each other related to CAF Operations. Coming Soon and under construction is the Resources Page. Have you ever wished that we had all our wonderful CAF resources all in one location? The idea is to build a repository of goodies that we all can share across the CAF. Send us your ideas on what to include as well as your documents which we can host online. And whether you’re looking for a CRM module or your looking to prepare topics for an upcoming ground school, the resources page is intended to be your one stop shop. We plan to have the resources page completed by Wing Staff Conference 2017. While your visiting the website, please be sure to take a moment and fill out our 2017 Operations and Maintenance Survey. The survey is aimed at collecting your voice on what you see as safety issues in the CAF. It only takes 5 minutes and your input is required. Its as simple as clicking on the navigation bar at the top of the website and following the anonymous questions. Hopefully you see that the website is easy to use and is dedicated solely to all of you hard working Operations and Maintenance folks. We want your feedback. Like it, love it, or hate it, we are working together to make the CAF Operations better and safer. Email Jim and David with your comments. Get Your Early Bird Pricing! Available until January 10, the early registration price of $400! Its important to know that the CAF is always looking to improve. In 2017 we want to hear your voice. Below is a link to the 2017 Operations & MX Survey. Its important that you take 5 minutes to complete the short questions. The results will be shared in the next few months. Its our intention to start multiple discussions this year related to making the CAF a safer operation. All of us understand the importance of what we do but often we underestimate what is at risk. The survey helps us identify those areas and improve. Your feedback is important. Anyone who volunteers in any capacity related to operating CAF aircraft is welcome to participate. Please feel free to forward this link to anyone in the CAF. At approximately 11:30 am on Saturday, Oct 15, a Houston Wing pilot was giving a ride for hire in Houston Wing’s Navy N3N bi-plane when he had a near miss with a drone. Here is his statement describing the incident. The next day the pilot contacted the Houston FAA - Flight Standards District Offices (FSDO) and they told him to send them an email with as much detail as possible. With the growth of uncontrolled drone aircraft flying throughout the U.S. all of our pilots need to be doubly aware of this growing hazard. Please report near misses of this type to your local FAA FSDO. We recieved word from the FAA that there are a significant number of cases where pilots are cutting the "Conditions of Issue" off of their medical certificates. For years we have been accustomed to this text being placed on the backside of our medicals. With the use of modern printers at your AME's office these are now to the right of your medical on the same sheet. The intention is to fold the paper. The instructions "Fold Here" are not explicit and removing the "Conditions of Issue" actually invalidate your medical. Pilots are actually not being allowed to fly in Airshows because of this invalidation of their medical certificates. Sure enough....I checked my own medical and I had cut this part off. Please check your medical and be sure its attached. If you find (like me) that you didn't "Fold Here" please see the attached link for the FAA site on how to apply for a lost or destroyed Medical Certificate. Fly Safe!